Chicken thighs, considered a dark meat, are not only less expensive than white breast meat, they also have more flavor, albeit more fat. Because of the extra fat, chicken thighs do not dry out as quickly as white meat does, lending itself well to high-heat cooking methods such as frying. You can deep-fry chicken thighs in a pan or in a deep fryer, and the amount of preparation and type of seasonings you use depend on the type of fried chicken you want to make, such as Korean fried chicken or classic Southern fried chicken. Chicken thighs can be fried boneless or bone-in and with or without the skin. Removing the bone shortens the cooking time for thighs. This is useful if you are pressed for time or need to fry large quantities of chicken. Leaving the bones in does not lead to more flavorful chicken; however, the bone helps insulate the meat, meaning less moisture is lost during the cooking process. You may remove the skin from the thighs, which lowers the calorie and fat content. However, the skin exudes fat as the chicken cooks, seasoning the meat. Removing the skin, while healthier, can lead to dry fried chicken. 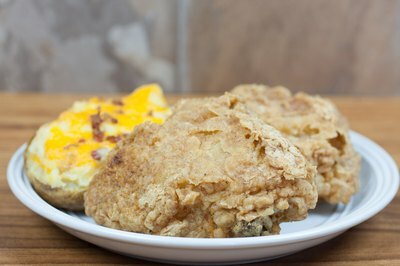 The type of seasoning you use depends on the type of fried chicken you would like to make as well as personal preference. Soak the chicken in a mix of salt, water and spices overnight; marinate it in a mix of spices or just salt and pepper; or leave it plain. The longer you marinate the chicken, the more tender the meat is, but it also takes on the taste of the spices. A classic marinade for Southern fried chicken is sweetened ice tea, where the chicken is left to soak for several hours to overnight. 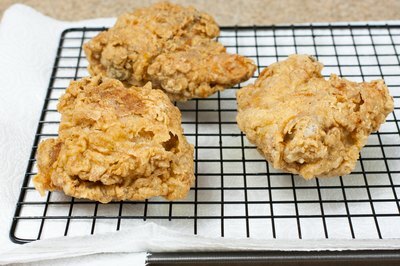 While you can fry chicken without any breading, most recipes require breading of some sort for crispiness. The crust that forms from the breading helps the chicken retain juices during cooking. Use white, whole wheat or rice flour to cover the chicken. Season the flour to taste. At a minimum, use salt and pepper as otherwise, the coating is tasteless and heavy when cooked. 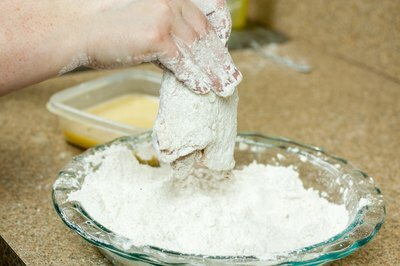 Do not add sugar to the flour as it burns during the high cooking temperatures. For extra-crispy chicken with lots of crunch, add in cornmeal. Double dip chicken to ensure an even coating, dipping first in the seasoned flour, then in an egg wash and again in the seasoned flour, thoroughly coating the chicken so all parts are covered. The difference between deep frying and pan frying is the amount of oil used. Pan frying uses less oil but requires you to turn the chicken as the meat is not fully submerged during the cooking process. Both methods can produce crispy, juicy chicken. While pan frying uses less cooking oil, deep frying requires activity during cooking. You also can deep-fry foods in a heavy bottomed pot, or you can use a dedicated home deep fryer. In both cases, use either vegetable oil, canola oil or shortening to do your deep frying as they can withstand the high cooking temperature. Use a candy thermometer to measure how hot the oil is. Heat the oil over moderate heat until it is 350 degrees Fahrenheit. While the oil is heating, ensure the chicken is completely dry — fully coated in flour. The less moisture there is, the crispier your chicken will be. If you are pan frying, add about 1 inch of oil to a large, heavy bottomed pan. 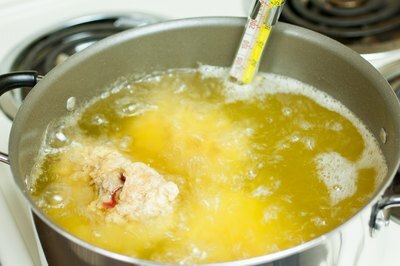 To deep-fry, fill the fryer with as much oil as needed to fully cover a piece of chicken with at least 1 inch of oil. Keep chicken in the fridge until the oil is hot enough; the cooler temperature will help it retain juice. 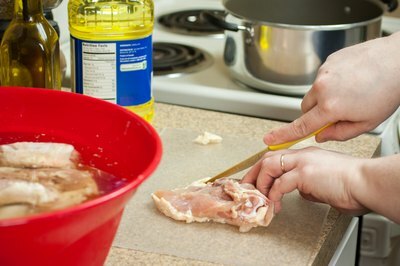 Slowly add pieces of chicken to the hot oil, ensuring the oil does not splash over the sides. Fill the pan until you cannot fit any more pieces of chicken. For pan frying, turn the chicken once the first side has crisped up and browned, roughly 20 to 25 minutes. Thighs are ready when they read 165 F with a quick-read thermometer. If the chicken is browning too quickly, remove the chicken from the heat and let it rest for 10 minutes before returning it to the oil. The ambient heat continues cooking the chicken without browning. Once it is fully cooked, place the chicken on paper towels to remove excess grease, and keep it warm in a heated oven until you are ready to serve. For extra flavor, serve fried chicken with sauce such as hot sauce or honey garlic. You may serve the sauce on the side or coat the pieces of chicken. serious eats: Do Bones Add Flavor to Meat?